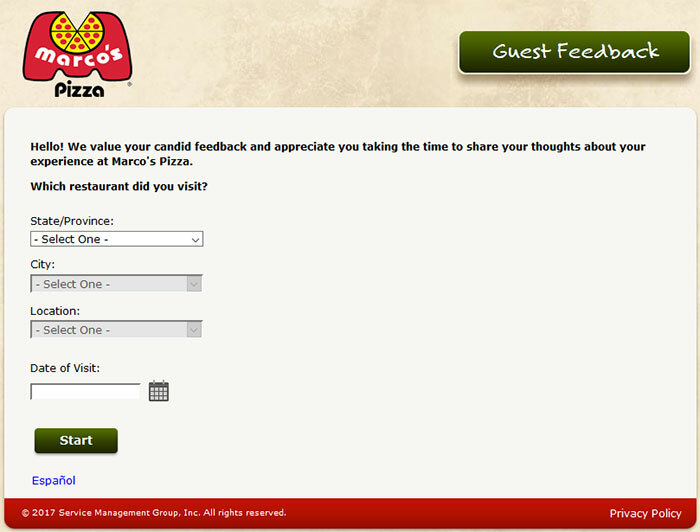 Marco’s Pizza guest feedback survey is powered by Service Management Group and is currently available in both English and Spanish. The purpose of this survey is to help Marco’s franchise owners, as well as the corporate office, determine what is and is not working in terms of business strategy. This survey serves three main purposes. The first goal is to listen to consumers’ complaints and compliments about the products currently being served by Marco’s Pizza locations. The second goal is to find out how staff and employees are treating customers. The third goal is to find out what the public has to say about ideas that the company could put into practice. Marco’s Pizza was founded by first generation Italian immigrant Pasquile “Pat” Giammarco in 1978 and since that time it has grown to over 800 locations. The corporate headquarters is located in Toledo, Ohio, although the company’s first location was (and still is) in Oregon, Ohio. In addition to calling your local Marco’s Pizza location you can place an order online – a once innovative idea that was somewhat pioneered by Marco’s. Marco’s has locations in 34 states as well as in Puerto Rico, India and the Bahamas. The company recently announced that it expects to have over 1,000 locations by the end of 2018. Marco’s was recently rated as #10 on Pizza Today’s list of the Top 100 Pizza Companies in the United States. Marco’s ownership has credited the company’s rapid growth and expansion to its fresh dough, three cheese blends and its special pizza sauce recipe. Smart phone, tablet or computer connected to the Internet. Date and location of the visit about which you would like to share your experience. Enter the date of your most recent visit, and use the drop-down menu to select the location you visited. Click “Start” or select “Espanol” to take the survey in Spanish. Answer the questions and leave any comments you may have in the appropriate text box. The current version of the Marco’s Pizza guest feedback survey does not provide the customer with any incentive to complete the survey, although this may change in the future so it is advisable to check the customer satisfaction survey link often for changes. Presently, the main point of this survey is to let the owners know if you had an especially good or bad experience, so if you would like to complain or pay the store and/or staff a compliment then this is an excellent way to do so.